Free Shipping Included! 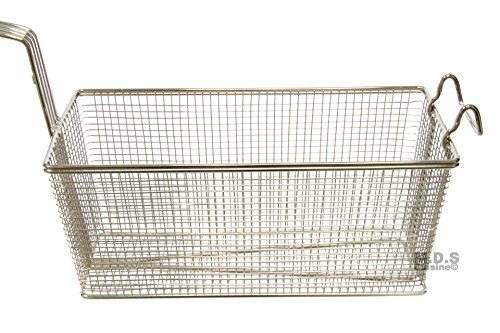 Baskets Frying 2 Deep Fryer Commercial Heavy Duty Stainless Steel Wired 13''L x 6.5''W x 6''H by Ematik at Baking Love. Hurry! Limited time offer. Offer valid only while supplies last. This Culinary set of (2) frying baskets is ideal for your everyday food services that frequently use commercial fryers to cook delicious fried foods. This Culinary set of (2) frying baskets is ideal for your everyday food services that frequently use commercial fryers to cook delicious fried foods. These set of 2 Baskets measure approx. 13-1/4" x 6-1/2" x 5-7/8" each. 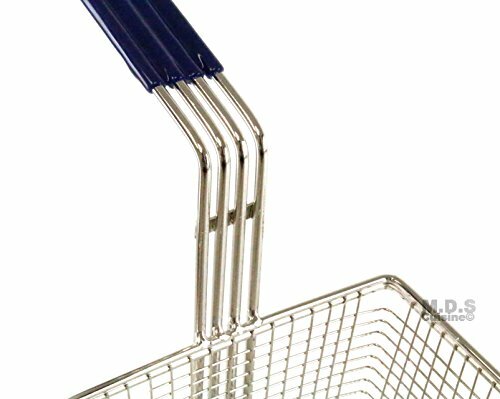 These commercial-grade fry baskets possess comfortable 10" dark blue handles which will boast sturdy grips and make transport simple. Both Constructed with nickel-plated stainless steel, these one-piece baskets are non-welded and have exceptional structural stability. 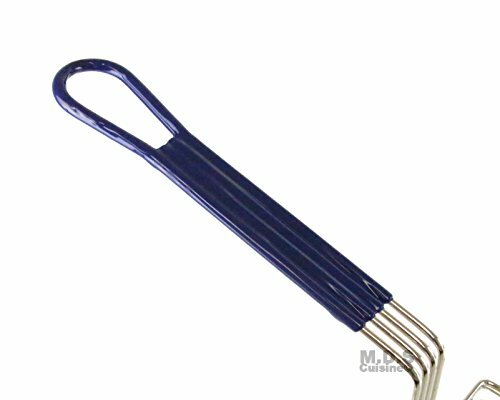 They are both easy to clean and maintain, the units possess plastic handles that provide optimal safety. A veteran chef or an amateur, these fry baskets will help you cook both safely and efficiently. 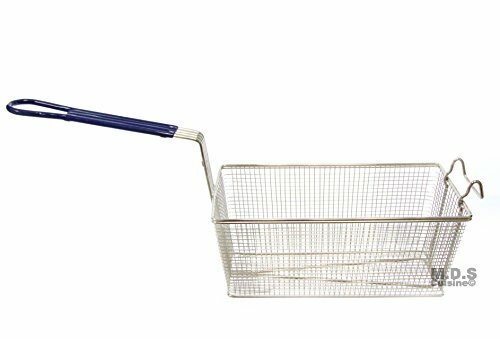 Both baskets are made with heavy-duty wire mesh, giving the fry baskets included in this set fine durability and making them built to withstand constant usage. Two is ALWAYS better than one, ensuring you that when it's time to get started, frying will be easier than ever to accommodate. Enabling you to fry twice as much food than with a single fryer basket, this kit is the perfect frying solution for any busy kitchen. Whether you operate a bar, in the catering service, upscale restaurant, or fast food establishment, these fry baskets can help will all of your food-service needs and functions to its full potential. Great for popular appetizers and favorite sides like French fries, mozzarella sticks, zucchini and onions rings, our baskets can also be used to perfectly fry entrees such as Fried Chicken, Shrimp, and Turkey. This optimal set of (2) frying baskets will help take your fried food game to the next level! Both baskets are Rustproof, long-lasting and durable. These baskets are designed specifically for use in commercial kitchens. The units' fire-resistant handles will keep your staff safe and content. Regardless of what you want to fry, these fry baskets are up to the task! 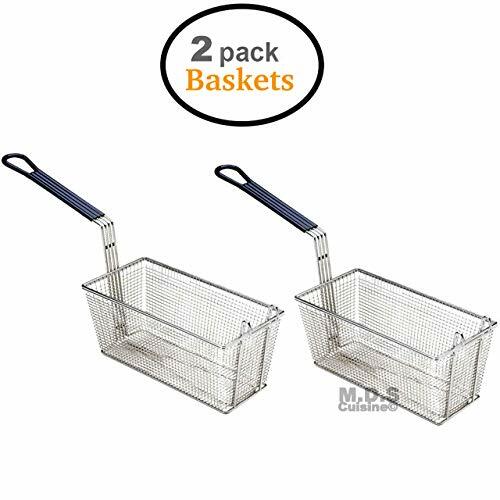 This Culinary set of (2) frying baskets is ideal for your everyday food services that frequently use commercial fryers to cook delicious fried foods. These set of 2 Baskets measure approx. 13-1/4" x 6-1/2" x 5-7/8" each. These commercial-grade fry baskets possess comfortable 10" dark blue handles which will boast sturdy grips and make transport simple. Both Constructed with nickel-plated stainless steel, these one-piece baskets are non-welded and have exceptional structural stability. They are both easy to clean and maintain, the units possess plastic handles that provide optimal safety. A veteran chef or an amateur, these fry baskets will help you cook both safely and efficiently. 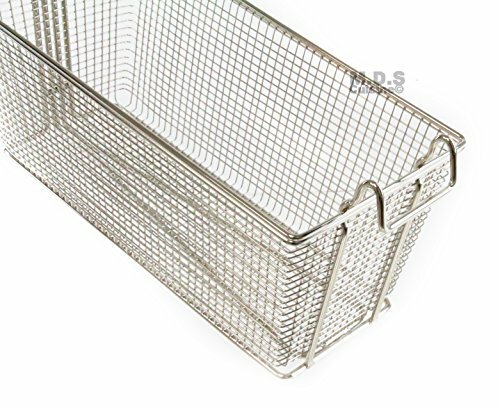 Both baskets are made with heavy-duty wire mesh, giving the fry baskets included in this set fine durability and making them built to withstand constant usage. Two is ALWAYS better than one, ensuring you that when it's time to get started, frying will be easier than ever to accommodate. Enabling you to fry twice as much food than with a single fryer basket, this kit is the perfect frying solution for any busy kitchen. Whether you operate a bar, in the catering service, upscale restaurant, or fast food establishment, these fry baskets can help will all of your food-service needs and functions to its full potential. Great for popular appetizers and favorite sides like French fries, mozzarella sticks, zucchini and onions rings, our baskets can also be used to perfectly fry entrees such as Fried Chicken, Shrimp, and Turkey. This optimal set of (2) frying baskets will help take your fried food game to the next level! Both baskets are Rustproof, long-lasting and durable. These baskets are designed specifically for use in commercial kitchens. The units' fire-resistant handles will keep your staff safe and content. Regardless of what you want to fry, these fry baskets are up to the task! If you have any questions about this product by Ematik, contact us by completing and submitting the form below. If you are looking for a specif part number, please include it with your message.